This report is contributed by John Pontifex of Aid to the Church in Need. Iraqi priest Father Dhiya Aziz is safe and recovering after two weeks in captivity in Syria, according to fellow Franciscans in Aleppo. The priest, who was released late yesterday (Monday, 4th January), is reported to have suffered extreme cold while he was being held and when freed was in a state of severe exhaustion. No other details have emerged about his condition. Speaking to Aid to the Church in Need today (Tuesday), Fr Aziz’s fellow Franciscans in Aleppo, northern Syria, said they had yet to establish if he had been tortured but that the priority now was sleep and rest. Fr Aziz’s disappearance was announced after he failed to return to his parish in Syria’s Idlib province on 23rd December. The priest had set off from the Syrian city of Lattakia, aiming to arrive in his parish before Christmas. The Franciscan had been returning from a visit to Turkey where he was visiting family who had fled from Qaraqosh, northern Iraq, seized by militant Islamic group Daesh (ISIS) in August 2014. Aid to the Church in Need Middle East projects coordinator Father Andrzej Halemba said that Fr Aziz was now recovering at an undisclosed location. “The Franciscans told me that in this Year of Mercy they were giving thanks to God for showing his mercy through the release of Fr Aziz. Fr Halemba said the identity of Fr Aziz’s kidnappers was as yet unknown. Fr Halemba explained that Fr Aziz has a pre-existing back condition dating back to an earlier kidnapping in July and a planned operation on his spine will now be rescheduled. The Custody of the Holy Land, the region’s Franciscan authority, announced Fr Aziz’s release late last night but added that, “due to confidentiality reasons,” no further details could be given about how he came to be freed. Fr Aziz was kidnapped on 4th July 2015 by militants in Yacoubieh and released after five days. 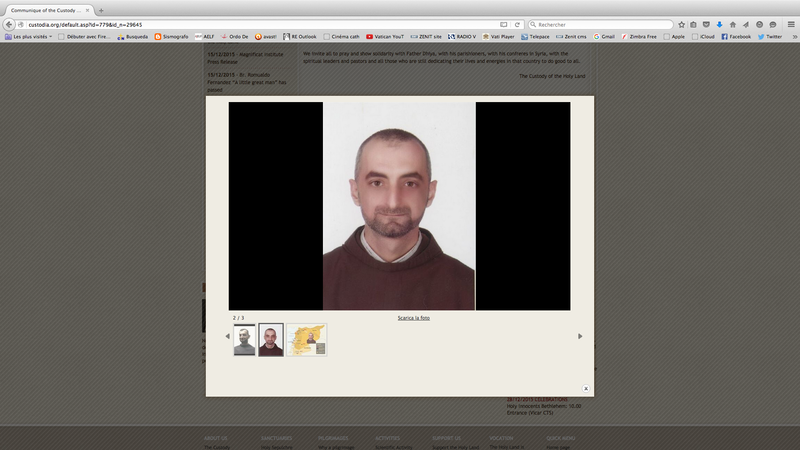 Fr Aziz is the latest in a series of clergy to be kidnapped in Syria. Among those still missing are Archbishops Boulos Yazigi and Yohanna Ibrahim of Aleppo, kidnapped in April 2013 and Jesuit priest Father Paolo Dall’Oglio, abducted three months later.